Leadership development may often be perceived as vague, time-consuming, or intimidating. In reality, it doesn’t have to be complicated. Using “Tony” as my fictional example, here is a proven, five-step mentorship/apprenticeship model that can be used to develop new leaders in church ministry. 2. I do. You help. We talk. 3. You do. I help. We talk. In this leadership development process, I act as the mentor and Tony acts as the apprentice. The first time we meet, I tell Tony to simply come to small group with me. I will lead the group, and all Tony has to do that first week is just watch me–see how I interact, what I say, what I do, how I lead the material. Then Tony and I are going to talk after that group is done. Maybe it’s a Wednesday night after the kids are in bed, and we go up to the local coffee shop for an hour. In the second step, I'm going to do, Tony is going to help, and we're still going to talk. In that next small group (or maybe just a couple weeks later), Tony is going to lead the prayer time and gather the prayer requests. I'm going to make sure that Tony and I meet that week and talk about it. This is Tony's opportunity to process what he's learning about leading the group, leading the material, and so on. Leaders are available to and for each other, so for whatever is on his heart or what he's challenged with, I'm available to him. Download our free guide on "Building Leaders to Launch New Congregations"
In the third step, Tony does, I help him, and we talk. You see how it's just starting to switch on us? As time goes on, he's taking more and more of the responsibility for the group. In the fourth step, Tony does everything, and I simply watch. And don’t worry, I’ve got his back because I want Tony to succeed. Leaders invest in other people. We want other leaders to win. And we still talk afterward. Never forget that part. It's really important because leaders are often made over a coffee table. Then in the last step, Tony does. But now, he's the mentor and he has his own apprentice, and the cycle continues on from there. 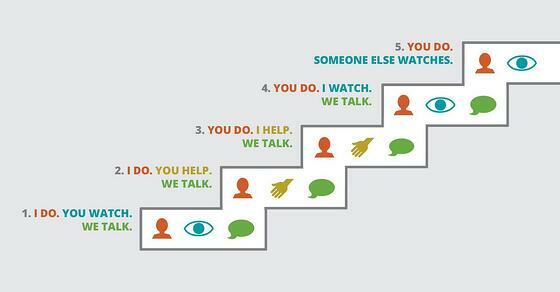 So what’s the time frame for each of these five steps? It could be as little as a week or as much as a month or more. It's all about how fast the leader develops, and that process will be unique to each person. The Five Steps of Leadership Development is a simple but effective tool that doesn’t overcomplicate leadership development. It is my hope that it can serve as a helpful model for you.